The Dublin government is to hold talks with the leaders of two of the main opposition parties -- pointedly excluding Sinn Fein -- as it struggles to cope with the consequences of its own ineptitude and corruption. 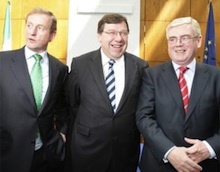 Fine Gael leader Enda Kenny and Labour’s Eamon Gilmore have today accepted Taoiseach Brian Cowen’s appeal for a confab of leaders. Only members of the established political order in Dublin needed apply. The talks are intended to secure the preservation of the current economic agenda through a general election, by means of a four-year budget plan. But it is also suspected that the talks are intended to safeguard the wealth of a privileged elite in Irish society, while marginalising the unemployed and the working poor. All of the independent TDs and Sinn Fein have been excluded from the extra-parliamentary process, without explanation. In a marked change of tone yesterday, Mr Cowen endorsed the Green Party proposal for a meeting of leaders -- with the exception of Gerry Adams. He said this was to establish if there is a basis for political consensus on the four-year plan, which has to be lodged with the European Commission next month. Talks will see a round-table meeting of Eamon Gilmore, Enda Kenny, Taoiseach Brian Cowen and Green Party leader John Gormley. In his letters to Mr Kenny and Mr Gilmore, the Taoiseach said he “greatly welcomed” the fact that “the main Opposition parties” accepted his target of achieving a fiscal deficit of below 3 per cent by the end of 2014. “This is absolutely essential not only to achieve stability, but to enable us to convince lenders and investors that our funding needs now, and over the four years ahead, can be met with confidence,” he said. As a result of the 35 billion euro Anglo banking fraud, the 26 County state is currently facing the danger that it will be forced into an EU/IMF bailout, which would effectively cede much of the state’s hard-won sovereignty to foreign economists and bureaucrats. In the Dublin parliament this morning, Sinn Féin’s Caoimhghín O’Caoláin reacted angrily to his party’s exclusion. He accused Fine Gael and Labour of being complicit in preventing others from participating. Sinn Féin President Gerry Adams said if the Taoiseach was serious about acting in the national interest, there must be an honest assessment of all the options available to tackle the economic and fiscal crisis. Speaking in Abbeyfeale, County Limerick, where he opened a new Sinn Féin office, he said measures to confront our present difficulties must address the exchequer deficit. “Discussions about how this can best be achieved should include those who take a different view to that of the Government. The Taoiseach’s decision to exclude Sinn Féin from discussions because the party has a different opinion is reprehensible. “It is ironic that the Taoiseach’s exclusion comes on the very day that Sinn Féin launched economic proposals in the North and invited all parties to attend. Political exclusion has never worked in this country. “Sinn Féin has proposals to cut the deficit but we will not rely on savage cutbacks to do so. Sinn Féin refuses to be part of a consensus for cuts that now involves Fianna Fáil, the Greens, Labour and Fine Gael.